I only know one person who actually LOVES to clean the bathroom. Personally, I’d rather spend more time with my family. That’s why I’m sharing How to Clean Your Bathroom in 20 Minutes. Speaking of family, I have a daughter getting married in May and a son getting married in November, so I’m in wedding planning overdrive right now. Between stuffing wedding invites, finalizing details with the caterer and finally finding my dress (whew! ), it’s a little crazy around here. I don’t have a whole lot of time left to clean. To add a little laughter to all the craziness of wedding planning, I’ve got my calendar marked for March 25th. That’s when My Big Fat Greek Wedding 2 hits theaters. It’s rated PG-13 and I can’t wait to have family movie night. We may not be Greek, but we have a huge family and can relate to this movie on so many levels. My favorite trick to keep my weekly bathroom cleaning session down to 20 minutes is to do a quick wipe down every day. I keep Windex® Original Glass Wipes in a top drawer of the bathroom vanity. They’re a fast and easy way to get a streak-free shine on my mirror, windows and more. I also keep my bathroom cleaning supplies together. I’ve found that it’s best to have a cleaner that does multiple jobs. 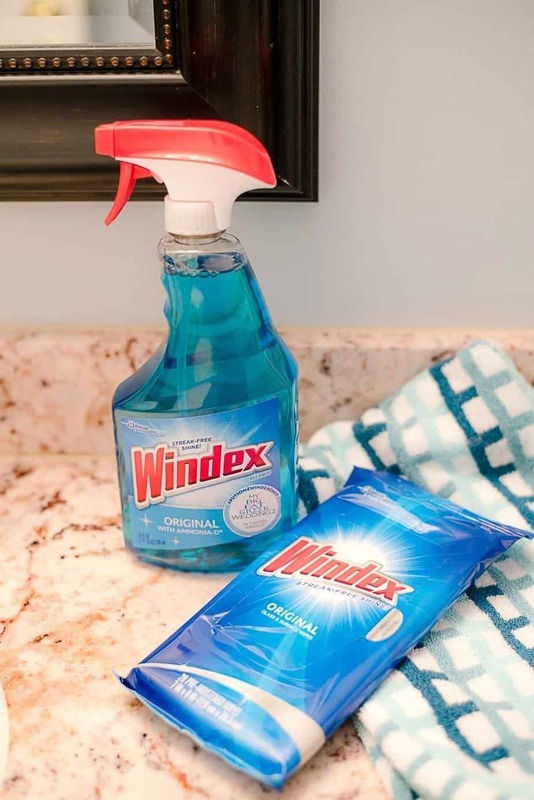 I use Windex® to clean windows, mirrors, sealed granite countertops, chrome bathroom fixtures, tile and more. Remove the rug and empty the trash can. Place them outside the room. I start with hanging a trash bag on the doorknob of the bathroom. Empty the trash can and dispose of any other trash. Start at the top and work down so that you never have to clean the same area twice. Spray the tub and sink and let the cleanser do most of the work. Spray the outside of the toilet with all-purpose cleaner and use toilet bowl cleaner inside the toilet. Wipe down the outside and wait a few minutes before cleaning the inside of the toilet with a toilet brush. 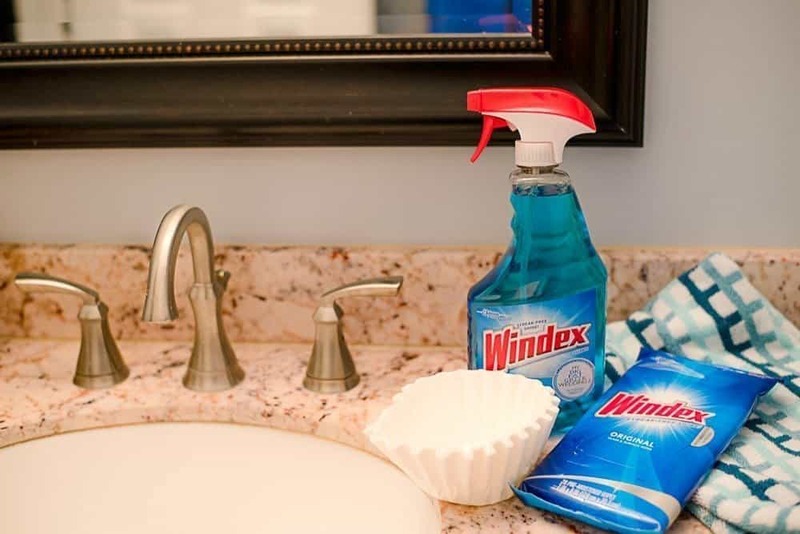 Spray the mirror, sealed stone countertops and bathroom fixtures with Windex® Original Glass Cleaner. Helpful Hint: After spraying the mirror, sealed countertops and fixtures with Windex®, I wipe them down with coffee filters. They’re inexpensive and leave no fuzz or lint behind. 4. Wipe down the tub and clean the inside of the toilet. After sweeping, I mop as I back out of the bathroom. Then I wait until the floors have dried and replace the rug and trash can. That’s it! Helpful Hint: I keep a check-list in my bathroom so I can see at a glance if I forgot anything. I’m sharing my free Bathroom-Cleaning-Checklist printable with you. For more great cleaning tips, follow Windex® on Facebook. What are your favorite tips? I really hate to clean the bathroom. I don’t like any cleaning, but bathroom cleaning is one of the worse. I haven’t seen those wipes before, and they might actually work well for me in one of our bathrooms. Oh how I hate to clean the bathroom! I want it to always be clean, but I don’t want to have to do it 😉 It’s my job though. 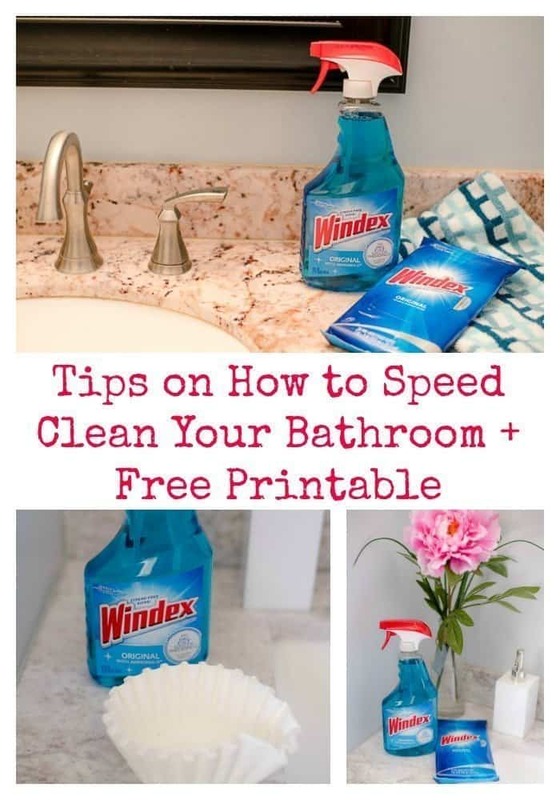 Windex is awesome for bathroom cleaning because it is good for multi-surface cleaning. Nice tip with the coffee filters. I’m going to grab that a $3 coupon this week too. Thanks! One of my least fav chore of the home! I do have a similar cleaning system like you and I try for 15 minutes (I have to work faster because of the kids)! I clean spray nightly so that they are clean and ready for the following day. I have not tried the new Windex and had no idea of using coffee filters. I’ll have to give them a try! Thank you for the awesome tips, Alli!! I have three 1/2 bathrooms in this house that need to get cleaned and it’s a chore and a half. We change the garbage out daily and the kids are responsible for making sure each bathroom has 3 rolls of toilet paper and a clean towel. We try and keep it tidy all the time and every other week we do a deep clean. I don’t mind it so much… but it gets old fast! I never knew about using coffee filters! I have a ton of them because I don’t have a regular coffee maker anymore. What a great way to use them up! I love it when I can finish cleaning the bathroom in only 20 minutes. 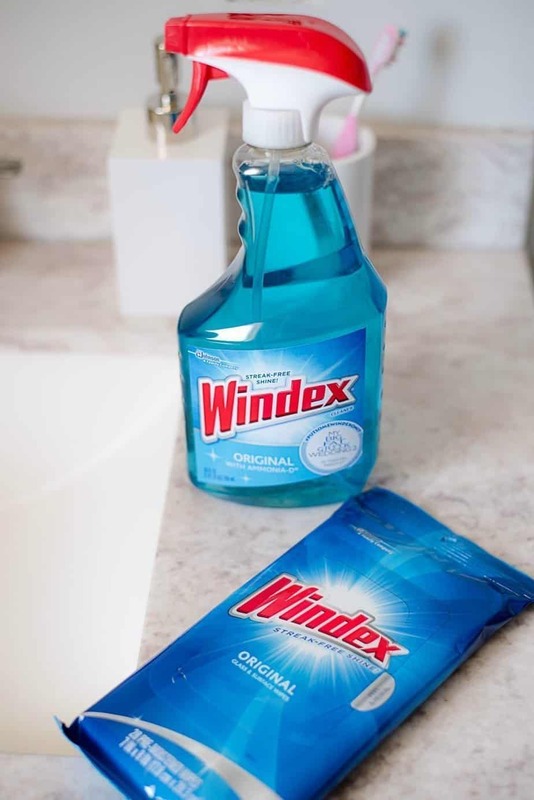 Windex is a great product for all those tough everyday messes! Thanks for these cleaning tips! I’m totally trying the coffee filters idea today! Great post! This is good advice. I just started on one of the bathrooms. I started with the shower heads and I’ll have to do the bulk of it later. Congrats to your son and daughter! I LOVE weddings so going to within a close span of each other should be fun. I’ll definitely have to use a few of these tips next time I’m cleaning my bathroom. Great tips! I feel like I am cleaning our bathroom every day of the week. It’s my least favorite room to clean int he house. The faster I can get it done, the better. 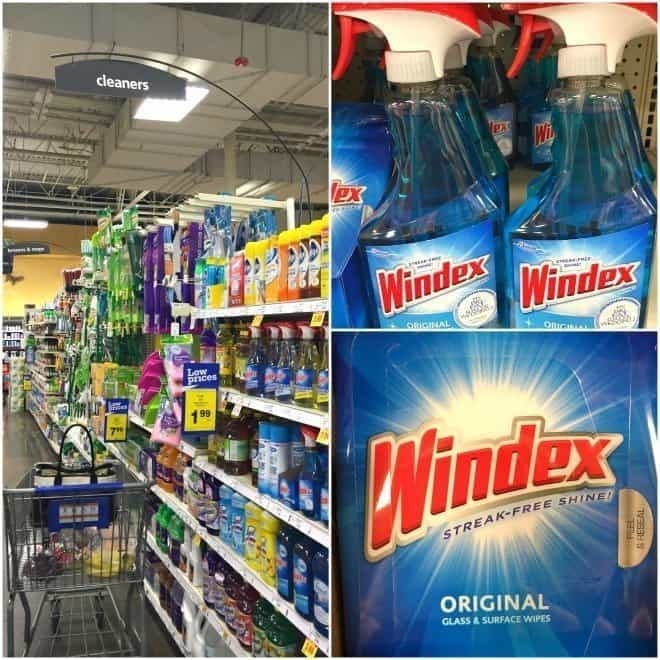 Windex is one of my essentials, and I love that you can use it for cleaning so many things! This is a great routine for cleaning your bathroom too, it’s very similar to the one I follow. Great minds think alike! Thank you for the wonderful checklist that I will use the next time I cleaned my bathroom. I absolutely love Windex wipes for chores like this. I do not enjoy cleaning my bathroom at all! It makes it a lot easier when you have good cleaning products though, because streaky mirrors are very frustrating! I am not a fan of cleaning the bathroom but I am a fan of Windex. A quick cleaning checklist is perfect for me to print and post it up for my kids to follow. LOL. Great tips! I am definitely not one that likes to clean my bathroom, but it has to get done. I always use Windex. It has so many purposes, and it really does create a streak free shine. Wiping up every day will cut your cleaning time down in every room! I try really hard to at least hit all of the counter tops every morning when we finish up in the bathroom. It makes a huge difference. Cleaning the bathroom is necessary but it is my least favorite chore. Because of this I like to get in and get out within 20 minutes. I have never used this product before but it looks worth trying! Thanks a lot for your tips! 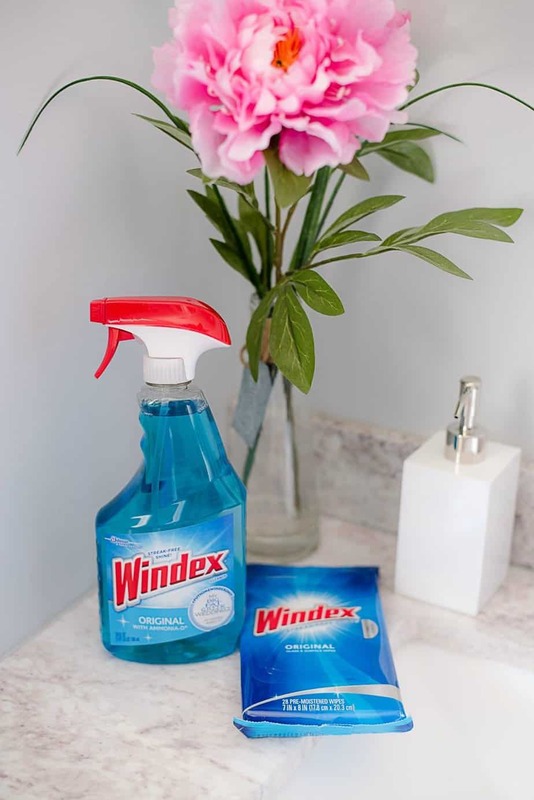 I used to love Windex and other cleaners until I discovered Norwex and how you can clean your home (including the bathroom, I have 4 boys) with just water!! No harmful chemicals needed and no residue left behind!!!! I do enjoy the article. I’m trying to clean and organize my bathroom. Basically, I have used muriatic acid to remove mineral deposits from my toilets; it does work. Though, I have got another product that operates at least as well. Thanks for sharing this wonderful tutorial with me.